Imprisoned for life aboard a zeppelin that floats high above a fantastic metropolis, greeting-card writer Harold Winslow pens his memoirs. His only companions are the disembodied voice of Miranda Taligent, the only woman he has ever loved, and the cryogenically frozen body of her father, Prospero, the genius and industrial magnate who drove her insane. As Harold heads toward a last desperate confrontation with Prospero to save Miranda's life, he finds himself an unwitting participant in the creation of the greatest invention of them all: the perpetual motion machine. 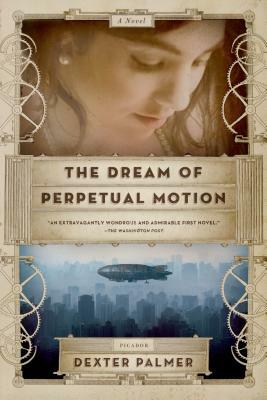 Beautifully written, stunningly imagined, and wickedly funny, Dexter Palmer's The Dream of Perpetual Motion is a heartfelt meditation on the place of love in a world dominated by technology. Dexter Palmer lives in Princeton, New Jersey. He holds a Ph.D. in English Literature from Princeton University, where he completed his dissertation on the work of James Joyce, William Gaddis, and Thomas Pynchon (and where he also staged the first academic conference ever held at an Ivy League university on the subject of video games). He is the author of The Dream of Perpetual Motion.